I have a piece of macrame rope with which I wanted to do something. Just i stick it like a coil and decorated it with mirrors and leaf shape sequins. 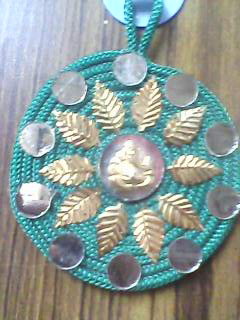 At the centre i stuck a ganesha idol which i got it from a marriage invitation. Does It look nice ?